AGL Energy has deferred its planned coal seam gas drilling exploration program at Gloucester in NSW to enable further community consultation, and has sold exploration permits in the Cooper Basin. AGL said it decided to defer the drilling program with some reluctance as it will impact its local suppliers close to Christmas. The deferral is until an independently peer reviewed hydrogeological study of the Stage 1 area is completed and the results made public; and the results of the judicial review into the consent for the Stage 1 gas production program are handed down by Justice Pepper. The drilling program, which has all necessary environmental approvals in place, will commence once these matters are completed, it said. "While AGL acknowledges that the Barrington-Gloucester-Stroud Preservation Alliance wants a new groundwater study initiated and completed without any involvement from AGL, the reality is that extensive groundwater monitoring has already taken place. This work will be independently peer reviewed by an expert appointed by the Gloucester Community Consultative Committee," it said. AGL is planning to drill six exploration wells on private land with the agreement of the land owner. In line with the current approvals and NSW Government moratorium, the program was not intended to involve fracturing of any wells nor gas production or flow testing. This postponement will allow for further consultation with the local community, said AGL's Group General Manager Upstream Gas, Mike Moraza. "Once we have the outcomes of the judicial review and of the independently peer reviewed water study, the drilling exploration program will recommence. AGL is committed to continuing to consult with the local community around all of our activities through to the development of Stage 1 of the project," Mr Moraza said. Meanwhile seismic surveying, ground water monitoring, irrigation trials, and helimag surveys will continue. AGL said that as discussed with the Barrington-Gloucester-Stroud Preservation Alliance, it intends to install additional monitoring bores to gain further information on water levels and water quality, and will finish partially completed roadworks to avoid erosion before site activities are suspended. AGL Energy has sold interests in five Cooper Basin exploration permits to oil and gas explorer Acer Energy. Acer Energy will acquire AGL's 37.5 per cent interest in PRL 14, 17 and 18 and PEL 103 and its 35 per cent interest in PEL 101 for $6 million. Acer Energy said there has been significant momentum in Australia to develop unconventional reservoirs through improved technology deployment, and that it believes application of these technologies can assist with the development of the tight oil and gas in the Flax and Juniper fields that contain significant independently verified volumes of hydrocarbons. Hydromet director Yang Chun Ming, who represents the Chunxing Group, has resigned from the board, effective immediately, The company said this was due to his busy schedule with new projects in China with Chunxing Group. August Investments has invested in newly listed Energy Action, while long time director Victor Dolmark has retired from the role. August said "Energy Action was listed on the ASX in October and is rare among environmentally positive equities in that it is profitable and will be able to pay regular dividends. Energy Action provides energy retrofitting services to organisations, providing them with substantial energy savings. "It also owns the Australian Energy Exchange where energy providers bid to provide the best energy prices to organisations and organisations are able to re-sell excess energy already contracted. Both services provide substantial savings and have environmental benefits." The Fund has also made top up investments in Qube Logistics CBD Energy. Equities now represent 52 per cent of its portfolio. Mr Dolmark was a director of August Investments for 18 years. "Victor joined the board of directors in March, 1983, just two years after the company was formed. His contribution to the governance of the company over these years  some of them during difficult times  is greatly appreciated. When he was initially approached to take up the position he accepted it willingly. Since then he has given freely of his time for very little return. We wish him well," said August Investments. Australian Ethical's Smaller Companies Trust has won Fund of the Year for the second time at the 11th annual Sustainability Awards in Melbourne. The awards recognize best practice in corporate sustainability. 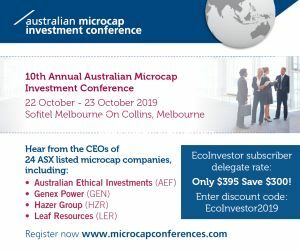 The managed investment fund section of the awards was judged by rating agency, Lonsec, which noted the Fund's impressive track record, the stability of the investment team and leadership stance it recently took on coal seam gas, which it said was a clear demonstration of its rigorous ethical investment process. Managing director of Australian Ethical, Phil Vernon, said Our award-winning flagship fund, the Smaller Companies Trust, which embodies our ethical investment process, has continued to outperform its benchmark and responsible investment peers over the medium to long term. "According to the recently released 2011 RIAA (Responsible Investment Association of Australasia) Benchmark Report the average Australian shares responsible investment fund has outperformed the average "mainstream" fund across 1, 3, 5 and 7 year time periods. "It is especially pleasing for us and our clients that our fund is therefore outperforming the mainstream market, proving that investing responsibly, in the likes of smart technologies, ground-breaking healthcare and energy efficiency, but without needing to be overly-exposed to the mining boom, can lead to consistently superior results." Ceramic Fuel Cells raised $16.9 million from its rights issue, share placement and overseas offer. The rights issue and overseas offer raised $11 million, the share placement $5.9 million. The company now has cash of $25 million. 38 per cent of the rights issue shares were subscribed, while 84 per cent of the overseas offer shares were subscribed. Chairman Jeff Harding thanked shareholders for their support "at a time of uncertain equity markets for clean technology companies". The additional funds will allow the company to increase production and reduce unit production costs. The company has over 600 units on order. Six Ceramic Fuel Cell directors participated in the rights issue. In more good news, Ceramic Fuel Cells' manufacturing partner in France, De Dietrich Thermique, has received CE certification for its micro CHP system called Ceramis Power. The first Ceramis Power unit will be operated with GDF-Suez, the largest gas retailer in France. De Dietrich plans to deploy the first 20 Ceramis Power units in France, Germany and Netherlands from 2012. Australian Renewable Fuels will focus on bringing its three biodiesel plants to full capacity over the next six to twelve months. It has been several years since the Picton and Largs Bay plants operated at or near capacity, said the company, and their performance has required the recruitment and training of new plant operators in addition to overcoming any technical difficulties as the plants are bought up to capacity. There will be some challenges and capital requirements but it anticipates full capacity will be achieved during 2012. The company expects biodiesel demand will be strong enough for all plants to be at or near capacity by the end of 2012. Demand for biodiesel continues to grow and is assisted by positive Government policy support, it said. The Federal Government has extended the Cleaner Fuels Grant Scheme for a further 10 years, effectively continuing the excise-free position of biodiesel, and the NSW Government mandate for biodiesel inclusion in fuels sold at the pump increases to 5 per cent from 1 January 2012. "We are also in discussion with each of the major oil companies in Australia regarding biodiesel supply. We are currently contracted with The Shell Company of Australia Ltd for biodiesel supply with this contract recently extended for a further two years," said managing director, Andrew White. The company has also investigated export options. ARF will complete an export order for not less than 4.5 million litres of biodiesel during the first half of this month. "This represents good profitable business for ARF and we are currently discussing a longer term contract for export supply," he said. Feedstock prices for tallow and used cooking oils are firm with average prices from $850 to $900 per tonne. Work continues on utilizing recycled mill oil (RMO) as a feedstock. This is taking longer than was anticipated but the company expects project completion and RMO available for production at each plant during the second quarter of 2012. Clean Seas Tuna raised $1,621,500 from its share purchase plan. The issue price was 8 cents per share. The company said it was encouraged by the extent of shareholder support considering the challenging share market conditions and that its shares traded at or slightly below the offer price for the majority of the offer period. Vmoto managing director Yiting (Charles) Chen has indirectly acquired 2 million shares, half at 1.82 cents each and half at 1.65 cents each. The total value was $34,700. Shares in Dart Energy hit a new low of 45 cents on 9 December. This was despite an announcement two days earlier that the company had entered a Memorandum of Understanding (MoU) for its first Gas Sales Agreement (GSA) in NSW, and a possible equity investment in an associated downstream horticultural glasshouse project. The project, by Maria's Farm Veggies Pty Ltd (MFV) in the Fullerton Cove area near Newcastle, will involve a $65 million glasshouse development that will initially grow quality tomatoes, capsicums and cucumbers. The project is expected to be completed by early 2013, and may be expanded. Dart Energy will supply coal seam gas to the project from a small number of wells and this will be used for heat and electricity. The proposal is subject to conditions, including final local planning approvals and Dart Energy establishing a commercial gas flow from the area. The company expects to drill two wells in the first half of 2012 as part of its gas appraisal program. Executive chairman, Nick Davies, said "The signing of this MOU is further evidence of our strategy at work. Dart seeks to develop CSG assets close to thriving gas markets where there is upside in demand and price and the ability to monetize gas quickly at attractive margins." Dart Energy's CEO Australia, Robbert de Weijer, said "Dart Energy has said consistently that coal seam gas development can co-exist with alternative productive land uses, including agriculture, in an environmentally sustainable manner. Today's announcement shows how our coal seam gas project can not only co-exist with but can indeed facilitate sustainable food production and associated job creation in NSW." "This project also highlights Dart's key point of difference in coal seam gas in NSW, that is the development of small scale, energy efficient power projects," he said. Key terms of the MoU for the Gas Sales Agreement include an initially 10 years term, and volume of up to 6.3 PJ over 10 years based on a highly efficient 8 MW combined heat and power plant delivering electricity and hot water to the project and excess electricity to the grid. Volume could increase to 2.4 PJ per annum if the project is expanded to 32 MW. The sales price is $7.50 per GJ linked to CPI, and this will be reviewed when the cost of gas production is known to ensure a return to Dart Energy. The MFV project is an initial 16 hectare glasshouse, a 4,000 square metre propagation facility, water storage and treatment facilities and CO2 sequestration. It will use the latest Dutch glasshouse technology, which has been used in many countries to achieve up to 10 times better yields than open field methods. Dart Energy will invest $5.2 million in MFV for an equity interest of 20 per cent, based on total expected project costs of $65 million. The investment is subject to the project achieving financial close, expected to be by quarter one 2012. The project is expected to deliver robust economic returns in its own right, in addition to the GSA. Dart said benefits of the proposed development include demonstration of the potential for CSG to co-exist with and enhance food production in a semi-urban environment, extremely low CO2 emissions as virtually all produced CO2 will be sequestrated by the crop to improve yields and plant robustness, and beneficial use of water as water from Dart's CSG development will be treated by MFV's reverse osmosis facility and re-used in the glasshouse. Emerging lithium producer Galaxy Resources said its Jiangsu plant in China has achieved mechanical completion one month ahead of its revised schedule. The Company received Construction Completion Certificates from contractor, Hatch Engineering. Project costs are expected to close in line with previous estimates. Carnegie Wave Energy has completed the preliminary design for the first CETO grid-connected project, and has put in a development and funding application for its 5 MW Ucluelet wave energy demonstration project off the west coast of Vancouver Island in British Columbia, Canada. The design of the first grid-connected project has focused on the full system including the CETO unit design and foundations, pipeline and onshore power generation facility. The demonstration project will be between 1 and 5 MW peak capacity with an optimum of 2 MW peak. Carnegie's chief executive and managing director, Dr Michael Ottaviano said "The completion of the preliminary design for the 2 MW grid-connected project represents a major step forward in CETO's technology maturity. The next phase is for Carnegie to confirm a final location for this demonstration project. This will be Carnegie's first power project and will deliver our first project-based revenues through the sale of the electricity generated." Power is generated by an onshore Pelton Wheel Turbine. A 200 mm diameter pipeline carries the hydraulic energy to shore from the CETO unit array. Meanwhile, Carnegie, through its British Columbian based subsidiary Pacific Coastal Wave Energy Corporation (PCWE), has submitted a formal proposal to the Canadian Government, via Natural Resources Canada, for project grant funding under the ecoENERGY Innovation Initiative. A decision is expected in Quarter 1, 2012. The Ucluelet Wave Energy Project has been under development for over two years and is already supported by the Province of British Columbia through a C$2 million grant from the Innovative Clean Energy Fund. Project activities to date include site and wave resource assessment, environmental scoping, conceptual design, fatal flaw analysis and securing of an offshore investigative licence through the BC Ministry of Forests, Lands and Natural Resource Operations. A Memorandum of Understanding is in place with engineering firm Hatch Ltd for engineering, environmental and project management services. Eden Energy's US subsidiary Hythane Company expects to receive an initial $300,000 order for 12 OptiBlend dual fuel units. The order is from an international drilling company that operates a large fleet of drill rigs in a number of counties including Australia. The units are for land-based drilling, particularly in the oil and gas industry and the large US shale gas market. The order will be the first order for multiple units for Hythane Company, although Eden India has received multiple-unit orders. Follow-up orders are also expected once the initial units are installed. A typical drilling rig has four engines, and so requires four OptiBlend units per drilling rig. Hythane Company has also begun development of a spark-ignited engine conversion system to allow operation on hydrogen-rich renewable biogas. Many sources of biogas contain methane and hydrogen, along with inert components like nitrogen or carbon dioxide, and with a few simple modifications these gaseous fuel blends generally allow operation in conventional spark-ignited engine generator sets (gensets) intended for natural gas fuel. New gasification equipment technology for cellulosic or wood-based biomass has the capability to produce a syngas with over 60 per cent hydrogen, it said. Enerji has scaled down its $25 million convertible bond facility with Fortensa Special Opportunities Fund. The parties have varied the maximum from $25 million to $6.25 million. With $1.25 million already drawn down, $5 million remains on the facility. The tranches have been reduced to $250,000 from $1 million. The conversion price is now the higher of 90 per cent of the volume weighted average price (VWAP) for a five day period in the previous 30 days (previously it was the average closing price) or 80 per cent of the VWAP for the five days prior to conversion. Enerji said that since it drew down $1.25 million earlier in the year, it has been unable to make further use of the facility because of the conversion price. Under the original agreement Enerji had to draw down a minimum of $12 million in the first 24 months or pay liquidated damages. Draw downs are still initiated only at Enerji's request. "The re-negotiation should get the facility working again and it can become a valuable funding resource for the company to complete the imminent installations of Opcon Powerboxes once our recently signed MoUs begin to bear fruit," said Enerji chief executive, Greg Pennefather. "Once the outstanding bonds are converted, it reduces the maximum debt from $1 million to $250,000, allows the facility to operate as intended providing a funding source for the company and reduces the number of shares that Fortensa holds after a conversion." "This revised version of the arrangement will assist in funding Opcon Powerbox installations that will become Enerji's revenue streams." Enerji said an added benefit of a smaller facility is that it will be better able to realize its goal of debt funding the implementation of Opcon Powerboxes sooner than might otherwise have occurred with the larger bond facility in place. The company is now in discussions with a number of potential debt providers. EnviroMission has raised $180,000 in working capital through the issue of 6,923,076 shares at 2.6 cents each. Following its submission of an Expression of Interest for funding from the Commonwealth Government's $126 million Emerging Renewables Program, Green Rock Energy has been invited to submit a Project Funding Application for its Mid West Geothermal Power Project near Dongara in WA's North Perth Basin. The company said the invitation does not imply that funding will be offered, but it considers the project is a strong contender for Commonwealth and State funding support. Green Rock's managing director Richard Beresford said 135 petroleum wells have been drilled in the area of the company's seven Geothermal Exploration Permits. "The extensive well and geological information provides a strong foundation for locating and designing geothermal wells, and drilling in the area is expected to be relatively straightforward. Electricity infrastructure is very close by and regional electricity demand is growing rapidly, particularly to supply the Mid West's many magnetite iron ore projects. Kimberley Rare Earths says significant high-grade rare earth intercepts have been returned from the drilling recently completed at Cummins Range in WA. High grade mineralization in the first 50 metres of the surface makes the deposit suitable for open pit methods, and a number of holes reported high grade heavy rare earth mineralization. Low levels of uranium and thorium were reported in the sample results. which will potentially reduce the radiation management criteria. The drilling program aimed to extend and upgrade the existing inferred resource. A total of 4,230 metres of drilling was completed in 77 holes resulting in 4,499 samples for analysis. Each sample is being assayed for the full suite of rare earths plus uranium, thorium, phosphorus, scandium, niobium, tantalum and a range of gangue elements. Half of the assays have been received with the remainder due by mid-December. In Africa, company has exercised its option to farm into the non-gemstone rights held over two tenements comprising the Malilongue project in north-west Mozambique. All conditions precedent under the Heads of Agreement with gemstone company Great Western Mining Lda (GWM) had been met, it said. Malilongue is a pegmatite hosted rare earths project with significant exploration potential, including for xenotime-hosted heavy rare earth oxides including yttrium, dysprosium and erbium. The mineral rights do not include gemstones. Exercise of the option for an initial 40 per cent in the project included making a payment to GWM of $250,000, taking total payments to $300,000); and issuing 1 million shares and 750,000 options exercisable at 30 cents each on or before four years from the vesting date. KUTh Energy has added an international projects adviser and a Vanuatu representative to its team. The Adviser International Projects is Jim Lawless, who has over 30 years experience in the industry. From 1999 to 2010 he was based in Auckland with Sinclair Knight Merz (SKM), and from 2008 to 2010 he headed the SKM geothermal resources practice as technical leader and has been heavily involved in geothermal projects worldwide. Lithex Resources has commenced drilling at its Moolyella Project 23 kilometres east of Marble Bar in WA. Lithex is targeting tin, tantalum and other rare metal bearing pegmatites and plans to drill a total of up to 3,000 metres across the hard rock pegmatite and eluvial targets at Pegmatite Gully and Eluvial Gully. Petratherm has put forward its Clean Energy Precinct concept with plans to deliver 600 MW of power to the growth market in electricity in the north-west of South Australia driven by mining developments. The Precinct will initially comprise gas and wind and later solar power and geothermal power connections. The Precinct has access to Petratherm's Paralana geothermal exploration licences that cover 1,900 square kilometres. Petratherm said the Clean Energy Precinct project is separate from, but complementary to, the Paralana project and is designed to be a key enabler of monetizing the large geothermal resource covered by the Paralana permits. The plan is to develop 600 MW of power generation to meet the expected demand over the next five to six years from large mining developments in the region. One option for connection to the "on-grid" market is via Olympic Dam and Petratherm says it intends to initiate commercial discussions with BHP Billiton to explore this. Other alternatives will also be considered. The capital cost for the project is estimated at around $1.5 billion. The Precinct project is located on Moolawatana Station, 50 kilometres north of the Paralana project. Moolawatana', a derivative of an Adnyamathanha aboriginal phrase that translates to Windy Place', has abundant solar and wind resources and hosts the Moomba to Adelaide gas pipeline. Rare earths explorer Strategic Elements says it has started a program to discover large new sources of strategic and precious metals. In New Zealand this includes fieldwork across a number of projects on the West Coast, and fieldwork on the Mandamus rare metals project on the East Coast. In Ireland grant and commencement of work on a significant new tungsten/ tin project. In Australia fieldwork on its projects. And airborne geophysical surveys to detect geological bodies hidden under cover. Managing director Charles Murphy said "Aan intense period of activity has started that will lead us strongly into the New Year. General market conditions are still tough; however we are positioning ourselves to take advantage of any rebound that may occur in the first quarter of 2012." WAG Limited, which is to be renamed PacPyro Limited, has issued a prospectus to raise up to $4 million through the offer of 20 million shares at 20 cents each. WAG has an agreement to acquire PacPyro, which is developing slow pyrolysis technology that converts waste and low value biomass into renewable energy/ electricity and a proprietary biochar called "Agrichar". To facilitate commercialization, PacPyro is developing a business model that targets revenue streams from licence fees, royalties, services and by-products, engineering revenue from project development/ delivery/upgrades and cash flows from project ownership interests. The offer closes 21 December, and the shares relist around 18 January 2012. Contact Energy is to acquire the 150 Megawatt diesel fired Whirinaki peaker plant in Hawke's Bay, New Zealnad. "The plant is a welcome addition to our portfolio, providing enhanced flexibility and fuel security to our existing generation capacity," said Contact CEO Dennis Barnes. "The plant will also help Contact's active development of an electricity hedge market in New Zealand and we have the option of moving the plant in the future and refueling it on natural gas, if market conditions and gas prices make such a move desirable."